There are numerous themes at play here: obsession vs. love; bigotry vs. openness; and cultural influences vs individual integrity. Instead of being heavy-handed in dealing with such lofty topics, John Boyne employs a steady undercurrent of humor that is disarming in its subtlety but often laugh aloud funny. The thread of the mother/son connection knits together the story as it weaves in and out of the narrative (Peggy A). (Reviewed by BookBrowse First Impression Reviewers). A picaresque, lolloping odyssey for the individual characters and for the nation that confines them…The book blazes with anger as it commemorates lives wrecked by social contempt and self-loathing…. a substantial achievement. This is nothing less than the story of Ireland over the past 70 years, expressed in the life of one man…highly entertaining and often very funny…Big and clever. By turns savvy, witty, and achingly sad…This is a novelist at the top of his game. An epic novel…The Heart's Invisible Furies proves that John is not just one of Ireland's best living novelists but also one of the best novelists of Ireland. Boyne creates lightness out of doom, humour out of desperately sad situations… a terrific read. Cyril’s life story is extraordinary, tragic, and triumphant…Readers will fall in love with Boyne’s characters, especially Mrs. Goggin and Cyril’s adoptive mother, Maude Avery, in this heartbreaking and hilarious story. Starred Review. Boyne, who has a wonderful gift for characterization, does a splendid job of weaving these various lives together in ways that are richly dramatic, sometimes surprising, and always compelling… Often quite funny, the story nevertheless has its sadness, sometimes approaching tragedy. Utterly captivating and not to be missed. Starred Review. With quick strokes and bitter humor, Boyne’s opening scene encapsulates the Irish church’s hypocrisy… Boyne continues his crusading ways with the quiet keening of this painful, affecting novel. An epic full of verve, humour and heart… sure to be read by the bucketload… deeply cinematic [and] extremely funny. Great book. But very emotional and heartbreaking. Cried multiple times while reading. So different from other Boyne books. Following Avery's story through the years was fascinating, his closeted love, his close approximation to his biological mother and the poignancy with which each phase of his life unfolded. Couldn't put it down. In The Heart's Invisible Furies, author John Boyne traces the evolving acceptance of homosexuality in Ireland through the life of his main character, Cyril Avery. 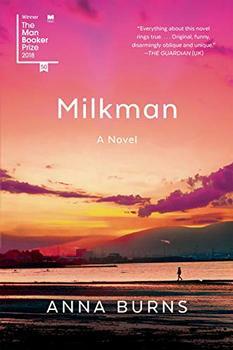 Winner of the 2018 Man Booker Prize, Milkman is a tale of gossip and hearsay, silence and deliberate deafness. It is the story of inaction with enormous consequences.